Date/Time - 10 May 2018 (Thursday), 8 p.m. Description - The Book of Acts highlights Jesus’ promise to His disciples of the power of the Holy Spirit they would receive. The Gospel of Luke focuses on the joy that filled the disciples after witnessing Jesus being taken up to heaven. What is the significance of the coming of the Holy Spirit, and of the joy that overwhelmed the disciples? Why is Ascension Day important, and why do we have to celebrate it? 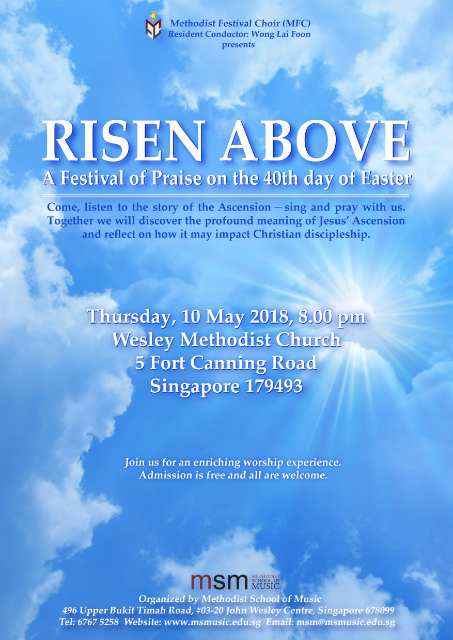 The Methodist Festival Choir invites you to ‘Risen Above: A Festival on the 40th Day of Easter’. Come, listen to the story of the Ascension, sing, and pray with us. Together we will discover the profound meaning of Jesus’ ascension, and reflect on how it may have an impact on our Christian discipleship. For more information, visit www.msmusic.edu.sg, email msm@msmusic.edu.sg, or call 6767-5258.